Producing, preparing, and performing Richard Wagner’s Tristan und Isolde is not for the faint of heart. Wagner’s operas demand so much from the singers, musicians, designers, and directors…arguably more than any other composer. Artistic consultant Peter Randsman started thinking about the possibility of a concert performance of the opera without orchestra, but with piano, to be performed in a small intimate performance space. His goal was two-fold; first to have the singers articulate the text…to be dramatic and to get the emotion out there without scenery or costumes and secondly to give singers a chance to perform this great and taxing opera and to give the audience the opportunity to hear it. Peter and his colleagues assembled a fearless cast of singers. Coordinating the performance was conductor and music director, Maestro David Gilbert, chief assistant to conductor Pierre Boulez at the 1976 Wagner Bayreuth Festival, and pianist William Hobbs, a soloist as well as featured pianist with orchestras, and ensembles. LeAnn Overton wrote the English subtitles. She is a vocal coach on the faculties of Manhattan School of Music and Montclair University. Peter Randsman has performed as an actor/singer in many musicals, has sung with the New York City Opera, and has his own artistic management company. He was very involved in working with the singers. 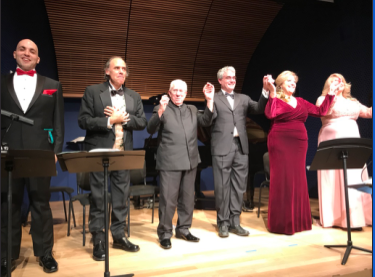 This Tristan was performed at the National Opera Center in New York City, to a sold out house on Friday evening, November 30. I am happy to report that it was a great success. Maestro Gilbert’s conducting was firm and totally attuned to every nuance of the difficult score. William Hobbs was amazing at the piano; for over four demanding hours he played with passion, drama, sensitivity, and understanding. The opera was sung in German, with English subtitles and, as is common in concert versions of operas, the singers had scores. However, they were still able to convey their emotions and interact with each other. The rehearsal period was only three weeks. The only singer in the cast who had ever sung Tristan was Adam C.J. Klein, who performed the role at the Seattle Opera. It truly is amazing that the performance came together so well. Tristan und Isolde is based on a 12th century Germany legend. Tristan is bringing Isolde to Cornwall by ship for her marriage to King Marke. Isolde and Tristan have both fallen in love with the other, but both keep their feelings hidden. Brangane, her maid, can see that Isolde loves Tristan and substitutes a love potion for the poison Isolde and Tristan were preparing to take. Under the spell of the potion, Isolde and Tristan admit their love for each other. Later they have a passionate encounter at night, but are discovered by King Marke, who is furious. Tristan flees to France despite the wounds inflicted on him by his former friend and betrayer Melot. Isolde follows him to France,but by the time she gets there he is dying. She dies by his side, enraptured and transfigured by love. The singers were all up to the task. After the first act prelude, the tenor, Jeremy Brauner, sang a lovely Irish song beautifully and clearly. He was equally at ease with three other roles; the betrayer Melot, a steersman, and a shepherd. There are few opera soprano and tenor roles that have as much singing as Isolde and Tristan do. Both Julia Rolwing, as Isolde, and Adam C. J. Klein as Tristan, proved to be wonderful in their parts. In Act I, Isolde’s narrative and curse, Julia Rolwing displayed the anger boiling inside. She has an even dramatic soprano range, from top to bottom and has no fear of the high notes. Her voice has a lovely dusky quality. Adam C. J. Klein was equally fearless in his singing. He has a bright tenor voice and uses it for dramatic purpose when called for. After drinking the love potion, they sang lovingly to each other. The Act II duet, which runs about 30 minutes, was introduced very delicately by William Hobbs and was sung with great love, excitement, and intensity. Act III belongs to Tristan; who sings for about 40 minutes, with a couple of interruptions by Kurwenal. While some tenors take some cuts in the third act, Adam insisted he would sing it uncut. The length of the scene did not prevent him from singing with passion and a strong, dramatic voice. The end of the opera belongs to Isolde. After all that singing, Julia Rolwing could still sing an unforgettable Liebestod…starting off slowly and gradually increasing in sound and going easily higher and higher until the music fades. Brangane, Isolde’s maid, was performed by Alison Bolshoi. Although she was a soprano, she is now a contralto. She has an exciting and even big booming voice from top to bottom. The lower notes of her contralto voice are absolutely gorgeous. Her singing of Brangane’s watch in Act II, was outstanding. Kurwenal, Tristan’s retainer, was sung by helden-baritone Bryan Glenndavis. His voice beautiful voice is very expressive and big. He is perfect for Wagnerian roles. King Marke, who is to marry Isolde, was sung by bass Eric Lindsey. I was extremely impressed with his distinctively beautiful bass voice. He sang without pushing his voice and was very dramatic in his castigation of Tristan. Justin McBurney, the English horn player had a lovely tone. He comes in for the third act. He played with great joy ,when appropriate and also great feeling. Thanks to all who participated in this wonderful performance. I found it very interesting just hearing the piano, especially played by such an excellent pianist as William Hobbs. Maestro David Gilbert led a brilliant performance. There is nothing better than hearing opera voices live. I hope that Peter Randsman and his group can perform other operas in a similar manner.